Captain Marvel opens in theaters everywhere this Friday, March 8th and I was invited to screen the movie early. Today, I’m sharing my reaction to the latest Marvel film, the newest (to me) Marvel superhero and what you should know if you plan to bring your kids. Before we get into it, I have to share some of my bias going in. As a woman and also a mom to boys, I always feel like I get prickly when it comes to women’s issues. I’m both excited for growth and sensitive to the way we grow. Presentation is everything and I think there is a way to elevate women without demeaning men. So, knowing nothing about Captain Marvel’s comic book roots, my first reaction to a female superhero story was a big fat eye-roll. Because I didn’t know she was already part of the MCU, for a minute I assumed that this was an age-old studio money grab to capitalize on a hot button topic. I’m telling you this because I need you to know that while I was excited about a new Marvel movie, I really wasn’t into “Captain Marvel” as a character. While most of my friends were super jazzed for a female lead, I worried it would be some political anthem rather than an entertaining movie. I do love Marvel movies so I knew I would see it regardless, but I wasn’t “all in” by any means. Captain Marvel totally won me over and I can’t wait to tell you why. There are no spoilers here so don’t worry! When the first trailer came out, I watched my friends get super excited. I was underwhelmed, but the more I learned about Captain Marvel in the days leading up to the film, the more excited I got about how it would all play out. The thing is, I didn’t want a SHERO. I wanted a really great Marvel superhero movie with an incredible superhero. And you know what? That’s exactly what and who Captain Marvel is. Captain Marvel is a Superhero. PERIOD. I don’t want to say Captain Marvel is a really great female superhero! To me that sounds a bit like, you look great for your age! So going into the movie, even though I was excited to see a Marvel film, I was looking at it through boymom-colored lenses. Yes, I want a strong female lead. I want someone who makes good choices and sees the big picture. I want someone who asks for advice and listens to reason. I want someone with really amazing superpowers. For nearly the entire 116 minutes of the film, I was completely into the plot and so excited about who Captain Marvel is, not only to the MCU but to us regular folks out here in the real world. I get the importance of visual representation here, but what struck me the most was how Carol Danvers is a human first. Yes, she is a strong woman, but she isn’t strong because she’s a woman. She is strong because she is a fighter and anyone can be a fighter. She was herself and proud of it. She struggled, she rose to her challenges, and I absolutely love this character. Yes, I teared up a few times and at least two of them were because of how I related to her. Was it because I am also a woman? I don’t think so. But what I do think is how we all have to figure out who we are and who we are going to be again and again. I won’t say more but I was really inspired and have a few quotes stored away! In fact, every character in this movie is so much more than what they look like and for me that was a major win. Assumptions are out the window and what’s left is a fantastic and entertaining movie. Who’s Origin Story is This Anyway? Captain Marvel is part superhero origin story and part Marvel magic that we all know and love. Carol’s story answers a lot of questions Marvel fans have had over the years and it’s as much Nick Fury’s origin story as it is Captain Marvel’s. As an Agents of S.H.E.I.L.D. television show fan, I loved seeing young Coulson in his early days. Was the de-aging CGI a distraction? For me, only as much as I was thinking, wow they really did a great job this time. We also see a nod to some Avengers plot points through the years and I found myself thinking OOHHHHH I get it now, more than once. I’m hearing a few people say things like the first half of the movie felt slow or that it was hard to get into. I get that because this is where you are really learning about everyone for the first time. Was there a lot of fighting at first? Not really. But I was still totally hooked on the story. Think of it like starting a new book. The first few chapters are laying the groundwork. And let’s face it, we haven’t had to do a whole lot of thinking during Marvel movies for a while because we sort of know who everyone is and how they fit. Even Black Panther was introduced to us alongside a few other Avengers when he was introduced in Captain America: Civil War, so going back in time and figuring out who Carol Danvers is with little support from any familiar faces was already a challenge. I thought they handled the backstory well and I wouldn’t be surprised one bit if some of that information comes in handy during Avengers: Endgame. And hopefully I don’t have to say this by now but be sure to stay for all the end credits scenes. Yes that means all. the. way. to the end of the last scrolling credits. Is Captain Marvel ok for Kids? 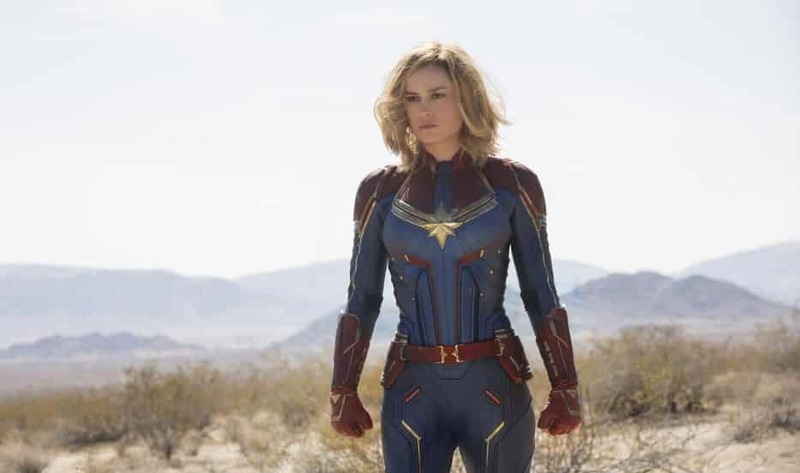 Captain Marvel is rated PG-13 for some fighting and some language. There is nothing sexual and if they are used to grand Marvel fight scenes, your kids will be fine. There are a few bloody noses and some jump scares but no worries on graphic violence here. I was concerned with the hand-to-hand combat with Black Panther when my boys were younger. I do not have that concern at all with this film. Depending on their age, some kids may get antsy during parts of the first half where there is more dialogue and less fighting, so your mileage may vary. It’s a very funny movie and there are a few parts I can’t wait for my boys to see so I can watch their reactions. We’ll be taking them (age 10 and 7.5) tomorrow night and I will revise this section after they’ve seen it! Captain Marvel is honestly one of the first Superheros (aside from Captain America maybe) that I really love as a role model for kids. I will have zero trouble encouraging Captain Marvel play and I guarantee we’ll be adding to our LEGO collections if my boys have a say. You won’t hear me say Captain Marvel is a great female superhero. Captain Marvel is a great superhero period and worth every minute of your time in the theater. CAPTAIN MARVEL has a run time of 116 minutes and is rated PG-13. See it in theaters March 8, 2019 and join the conversation on Facebook, Instagram and Twitter with the hashtag #CaptainMarvel. I can’t wait to hear what you think of Captain Marvel! Leave me a comment here or find me on social @AndreaUpdyke and let’s chat!